Connected Senior Care Advantage by Austin Regional Clinic & Premier Physicians is a program built on the premise that through stronger connections between patients and primary care physicians; between health plans and those caring for patients; and between doctors who treat the whole person and those who specialize in a specific procedure or condition, care can be transformed. Starting January 1, 2019, all patients with Austin Regional Clinic or Premier Physicians patients who are enrolled with the Health Plans listed below will automatically be enrolled in our Connected Senior Care Advantage (CSCA) program. Our Medicare Advantage patients will work closely with their primary care physician, care team and specialist physicians to prevent, anticipate, and manage health issues to maintain their best health in the most convenient and cost-effective manner. 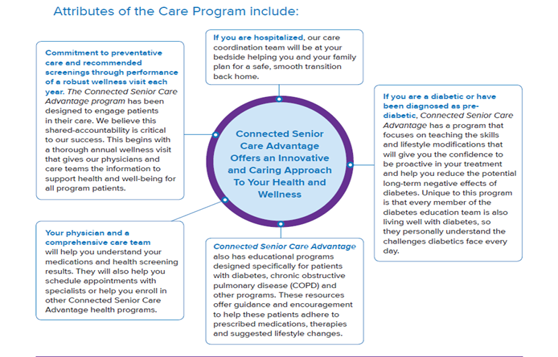 Connected Senior Care Advantage is not a new Medicare Advantage plan. Rather it is a new approach to care delivery which focuses on preventative care, care coordination resources, when you need them, and an appreciation for the demands and constraints on your desired lifestyle. The primary care physicians at ARC and Premier Physicians are committed to supporting you in reaching your health and wellness goals. We encourage our Connected Senior Care Advantage patients to complete an annual wellness visit with their primary care physician. This comprehensive, individualized assessment provides an annual roadmap to improved health and wellness. It is also the gateway for our patients to access specialized programs designed for those who need more focused care coordination resources.